I'm delivering on my promise to post over-exposed photos of my climbing partners' asses. 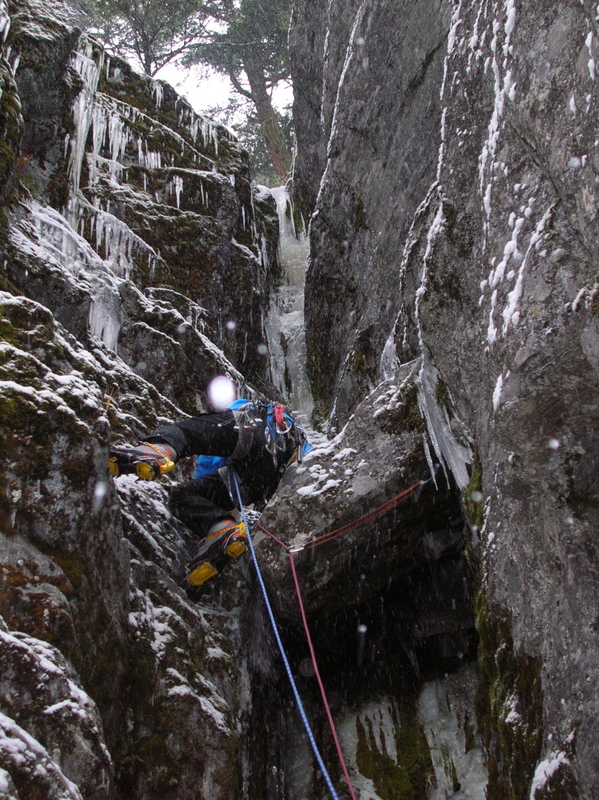 The coastal ice climbing season began promisingly enough. In late november, Ken Glover and I got scooped on Blue Moon on Rye at the Green River Bastion near Pemberton and climbed this chimney system on the left side of the crag as a consolation. It was the middle of three such lines and although never particularly desperate, it provided four short pitches of entertaining 'scottish' style climbing. As far as I can tell, the success of a blog has as much to do with the frequency of posts as it does with the quality of content. When the average blog reader is looking to waste their time or avoid whatever it is in the real world that they ought to be doing, reliability is of paramount importance. As a semi-professional time-waster and procrastinator, I can say this as a result of more than idle speculation. 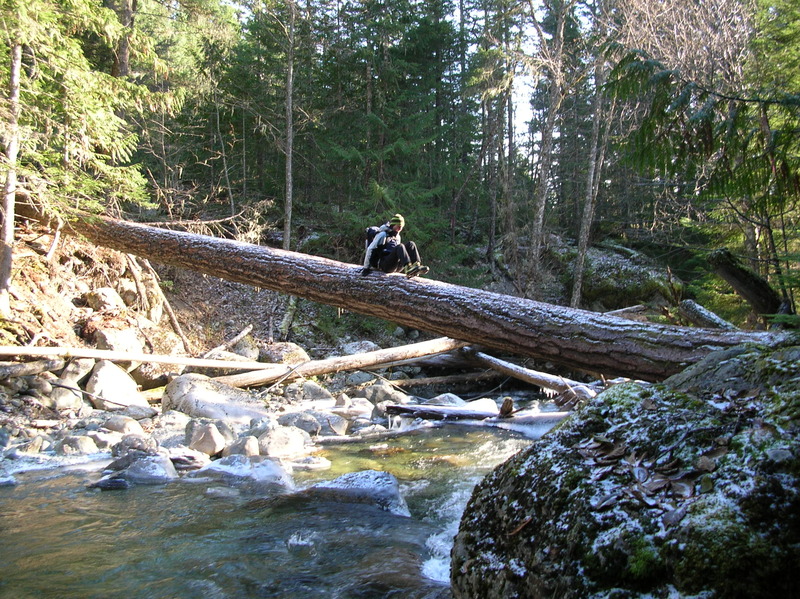 Karina Benavides crossing a log over Owl Creek near Pemberton. 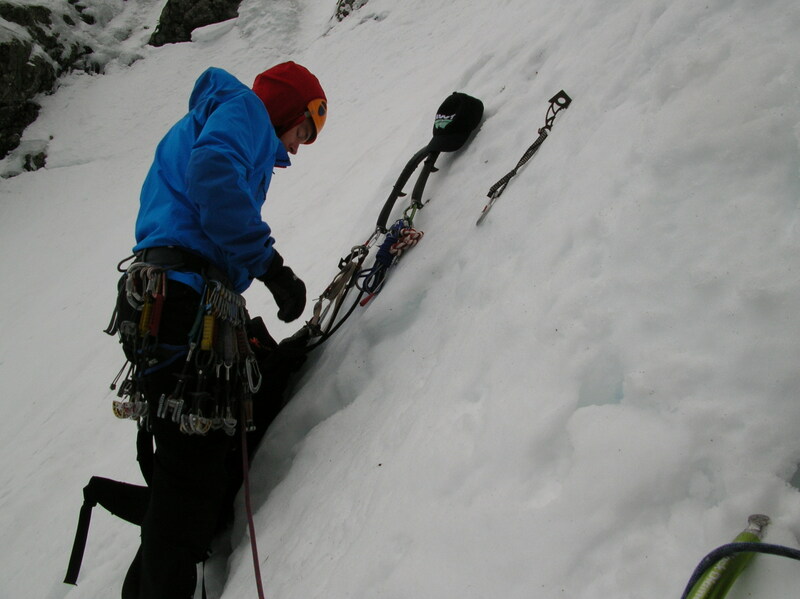 In late november we climbed some ice a bit to the left of a route called Rusty. We did a 60 meter pitch which began with a short pillar and finished with a low-angled but very thin ramp. Unfortunately, I haven’t done have any interesting climbs recently to report on (hence the above photos from this fall). It’s frustrating to have time, partners and a long list of objectives when the weather and conditions are uncooperative. With the exception of some cragging and bouldering on rare occasions when the rains have abated, I’ve actually been spending most of my time skiing. Ken Glover about to carry a rather large rack of gear up a relatively mellow snow slope after it proved to be too warm for the route we'd hoped to attempt. What's truly impressive is that he put his harness on over his crampons while standing in this fairly precarious and exposed spot. Although I’ve been heard to say that a bad day climbing is still better than a good day skiing, I’m beginning to develop a grudging appreciation for sliding down hills on a pair of planks. 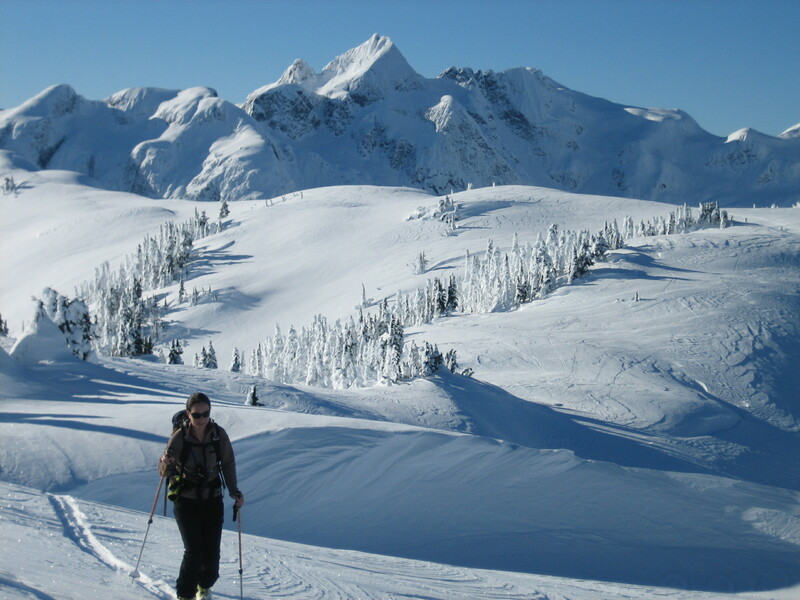 Karina skiing near the Brew Hut. • Ski hill fashion. Admittedly most forms of fashion are lost on me, but the popularity of things like neon and plaid seems a bit odd. • Helmet cams. Literally every second person in the lift line seems to be wearing one. Am I the only person who thinks that the footage tends to makes even good skiing look both boring and nauseating? For example, I once decided to ride a mountain bike trail on the north shore after seeing a POV video that made it look flat and easy. In actual fact, it was terrifyingly steep and I ended up having to walk my bike down much of it. • Turns for the sake of turning. I think my cross-country ski racing background has ingrained in me a need to ski as fast as possible at all times. Unfortunately, this can make a lot of backcountry yo-yoing a bit boring. Why bother skinning uphill for an hour only to straight-line it right back down again in approximately 30 seconds? • Steep descents with multiple rappels. I actually have a great deal of respect for people making serious steep descents. After all, isn’t skiing without the possibility of falling to your death a little dull? 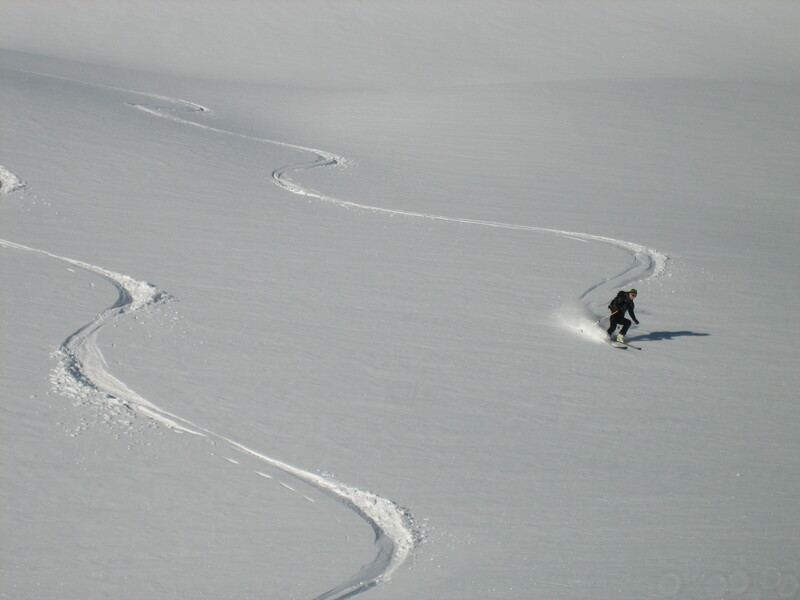 However, trying to quantify steep skiing is a bit trickier than something like climbing. How many rappels can you make and still call it skiing? • Telemarking. Just kidding. Although I don’t understand why all the focus is on making the gear heavier instead of lighter. Ultimately, it's hard to complain too much about being out in the mountains on a nice day. Karina with Tricouni Peak in the background.